There’s a burning question in everyone’s mind: Which is better, PlayerUnknown’s Battlegrounds or Fortnite? Despite having put time in each, I find PUBG to be the more fulfilling experience, and that’s because it’s not afraid to slow you down. The Fortnite-enjoyers in my life often cite the game’s fast-paced frenzy as a reason they enjoy it more than other battle royale games. It’s true that it’s a game that rewards action. Running around more means you’re going to get more materials for building. Building more, and getting practiced at it, means that you’re going to be able to create defensive structures in more strategic ways than your less-practiced opponents. Furthermore, winning and losing in Fortnite is faster. Games go by quickly, and if you die then you can just queue up and be right back in a game with very little downtime. The problem is that I like the downtime. 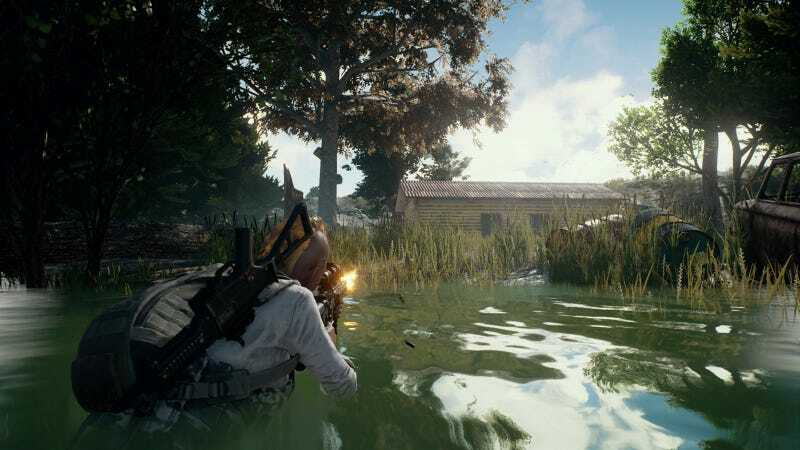 Back when PUBG first starting getting big I wrote about the things I loved about it. Playing as a solo player, it can be a calm, tense experience that is punctuated by firefights that could either end in an instant or drag on across the landscape for minutes at a time. With your headphones up, you can hear the ambient noises of the game, and if they’re interrupted by enemy footsteps you’re in for trouble. It makes my heart race just thinking about it. Fortnite is the opposite of that. It’s not a game designed around waiting for anything. Instead, you’re encouraged by a small map size, the ever-enclosing electric storm, and the highly visible building system to come into contact with other players. It’s rare to go three minutes without seeing someone, or at least seeing the structures they have built, and you’re highly incentivized to take a fight when you see them. After all, they’re going to start shooting as soon as they see you, and it’s not as if there’s any kind of hiding of stealth in the game. By contrast, most of my games of solo PUBG are spent sneaking to get an angle on my opponents. I become a tactical Sam Fisher wannabe, snaking around corners and peeking through the line of sight that forms between an open doorway and a smashed out window. PUBG demands that you consider every action that you make. If you don’t, you’ll be punished in a significant way, especially if the opponent you’re up against knows how to operate the game better than you do. Crucially, this is not a question of tactical realism or “skill ceilings” or any of the other ways that competitive games get compared. Instead, it is about what each game encourages me to do in its world. Fortnite is a small world full of violence that wants you to have an arcade-y experience of fun and shooting. It does that, and it does it even better with your friends. None of this is bad. It’s just not what I enjoy from the battle royale genre. Instead, I like the idea of making a good plan, picking a position with a good sightline, and picking off enemies as they approach me. I like the rush of dodging gunfire over a long distance before storming a fortified position with some grenades and a SCAR. I like the long calm before the lightning strike. I realize that many people don’t play the game this way. They squad up with their friends and scream and yell and try to get their wins. That’s the vast majority of the games that I am playing in these games right now, too. But there’s something to the slowness and the methodical play that PUBG allows that Fornite has specifically designed away from. That slowness is something that I love, and I can’t help that it makes for a game that I enjoy playing more in PUBG.